Using a highlighter became such a big part of my everyday makeup routine that I don’t know how I did it before. 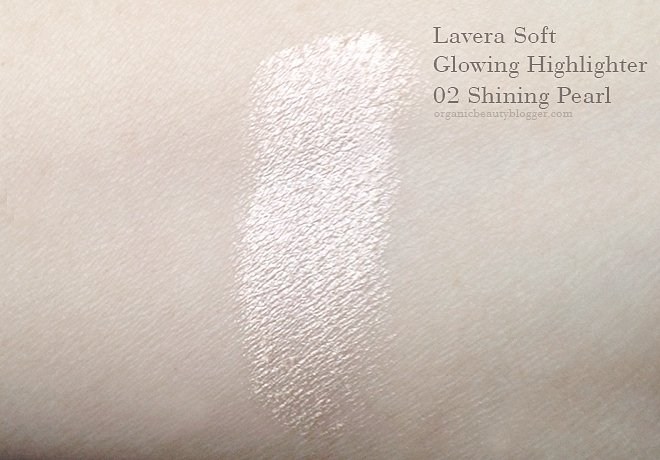 This Lavera Soft Glowing Highlighter was tempting me for quite some time, and despite the fact that I already have a few highlighters, it still seemed like something worth to give a try. 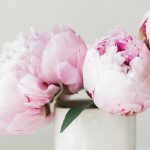 Lavera Soft Glowing Highlighter is a cream highlighter made with organic moisturizing ingredients such as argan oil, cacao seed butter, and cabbage rose flower extract. It comes in 2 colors: Shining Pearl and Golden Shine. The color I have is Shining Pearl – a beautiful pale pearl pink. It does have some tiny glitters, but it looks more pearly and metallic than sparkly. Ricinus Communis (Castor) Seed Oil*, Simmondsia Chinensis (Jojoba) Seed Oil*, Mica (CI 77019), Titanium Dioxide (CI 77891), Dodecane, Bismuth Oxychloride (CI 77163), Copernicia Cerifera (Carnauba) Wax*, Hydrogenated Vegetable Oil, Hydrogenated Rapeseed Oil, Argania Spinosa Kernel Oil*, Silica, Lecithin, Butyrospermum Parkii (Shea Butter)*, Theobroma Cacao (Cocoa) Seed Butter*,Cocos Nucifera (Coconut) Oil*, Hippophae Rhamnoides Fruit Extract*, Tocopherol, Iron Oxide (CI 77491), Vegetable Oil (Olus Oil), Olea Europaea (Olive) Fruit Oil*, Hydrogenated Lecithin, Camelina Sativa Seed Oil, Rosa Centifolia Flower Extract*, Tilia Cordata Flower Extract*, Malva Sylvestris (Mallow) Flower Extract*, Helianthus Annuus (Sunflower) Seed Oil, Ascorbyl Palmitate, Alcohol*, Fragrance (Parfum)**, Limonene**, Benzyl Salicylate**, Linalool**, Geraniol**, Citral**, Citronellol**, Benzyl Alcohol**, Benzyl Benzoate**. * Ingredients from certified organic agriculture. ** Natural essential oils. Certified by Natrue. Vegan. The highlighter is pretty thick, and you only need a small amount to see the result. Like most cream highlighters, I find it best to apply with fingers for a natural and radiant glow. Otherwise, I’m risking to apply too much of it. 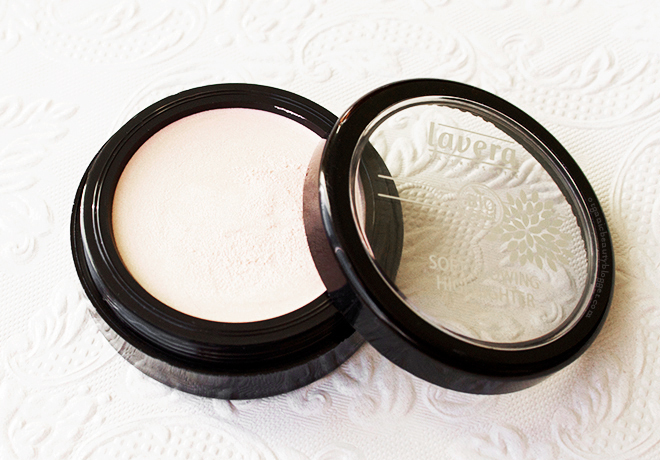 I like using it on my cheeks over the blush or in the corners of my eyes to make my face look more fresh and awake. It doesn’t smudge and looks lovely all day. Having its price and the effect in mind, I think it’s a real bargain! I still wish there would be zero glitters, but since the glitters are not so obvious, I don’t mind them that much. 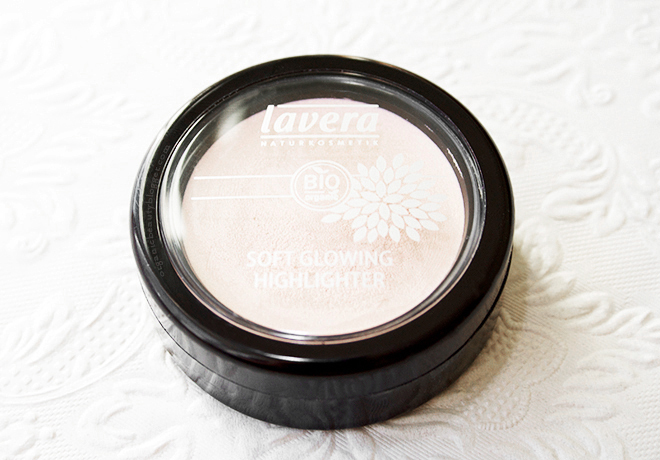 Lavera Soft Glowing Highlighters are available at Naturisimo, Ecco Verde for approx. $11/£9.50. 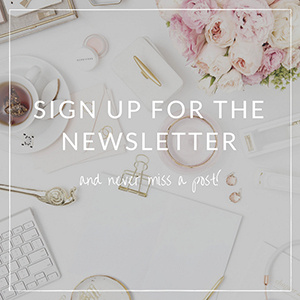 Have you tried Lavera Soft Glowing Highlighters? What a gorgeous highlighter. I wonder how much glitter is in the Golden Shine shade. I saw some swatches of the Golden Shine on other blogs and in some photos taken in direct light you can see some glitter. Though, it still looks subtle and not too sparkling . Would love to see the Golden shine shade. 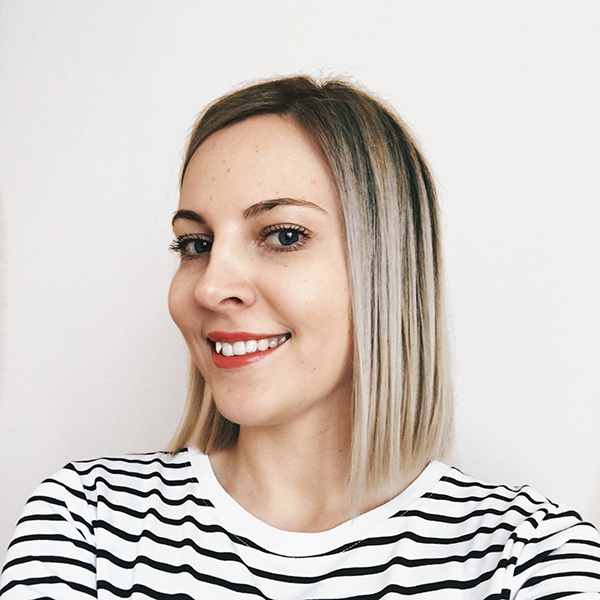 Is it a bit darker? Golden Shine gives warmer golden glow, while Shining Pearl (the one in my review) is cooler pearl pink. Love this! Your reviews are so enthusiastic, I feel like you’re sitting in my living room. Thank you for the kind words, Stephanie!